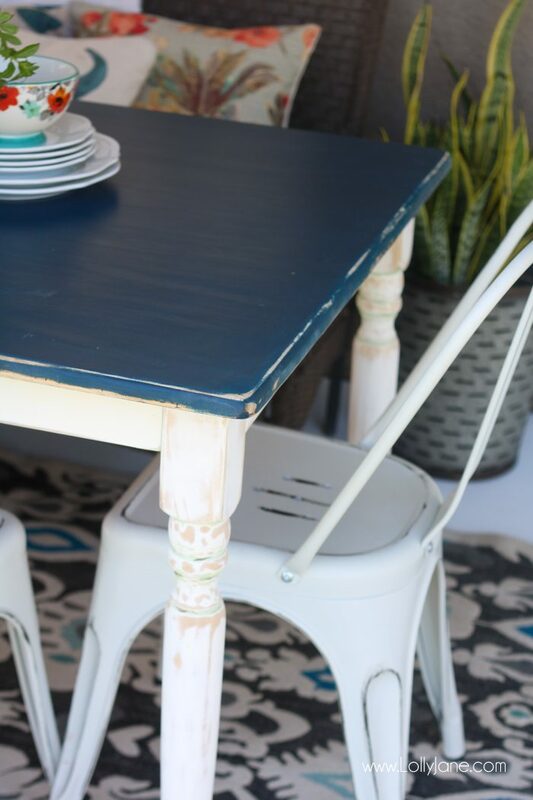 One of our very favorite things to do is give new life to an exisiting piece of furniture. Kelli was given a pretty dining room table from her in-laws and sat with a heavy natural lacker for several years before she painted it white and stained the top. 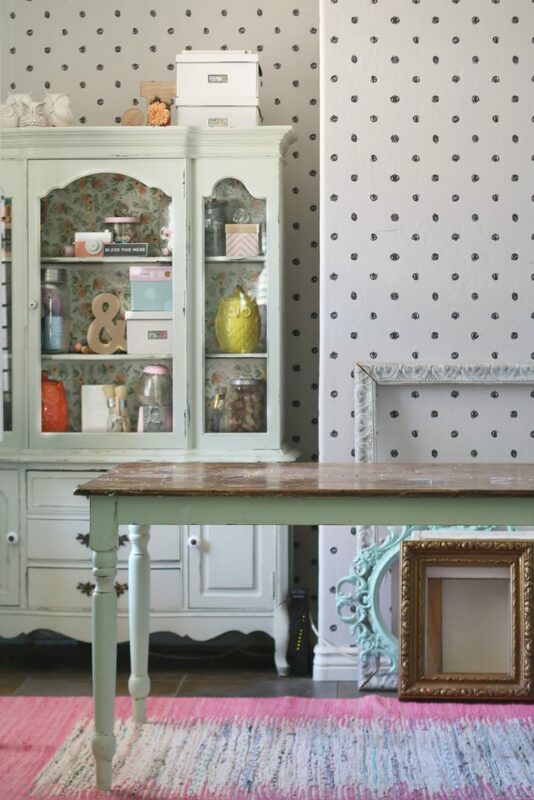 After she moved it into her craft room, she repainted the bottom half in in a minty hue. She gifted it to me recently and it’s been in my own craft room with messy paint splatters, watercolor spills, and dabs of leftover hot glue gunk on it. To say it has been loved (and well used) is an understatement! 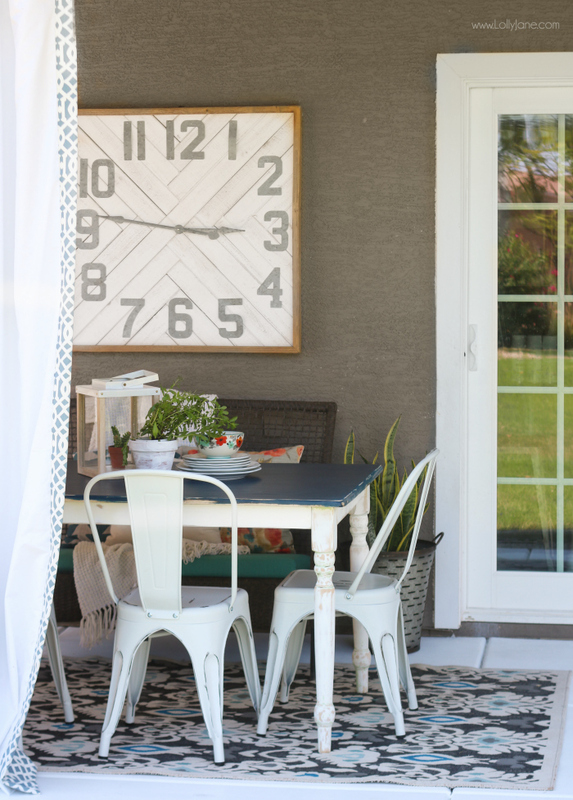 I am now converting my craft room to a playroom and moved this table to its final home, my back patio, to house summer BBQ dinners and host game nights. But, I can’t have family eating over old glue spills so yes, another makeover is due. I love the feel of stained wood as opposed to painted wood but also love color. 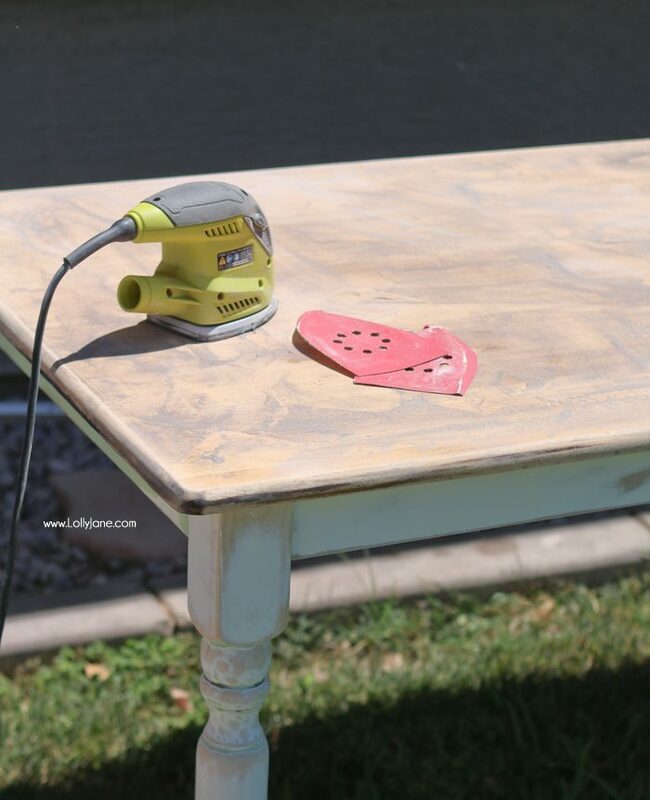 Enter KILZ® tinted wood stain, a total game changer for furniture makeovers. I was introduced to KILZ® Weatherproofing Solid Color Stain and was impressed by their varities of colors. 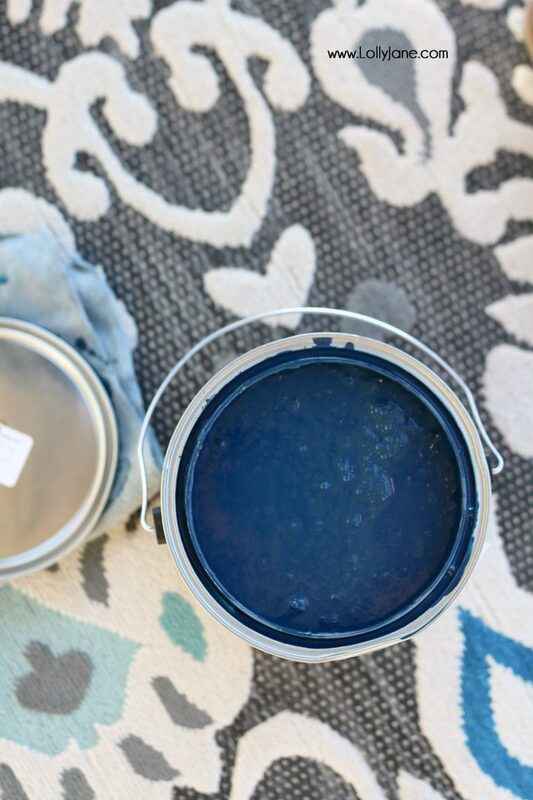 Since I have pops of navy blue in my outdoor rug, I decided to go bold and stain the top in “Atlantic Deep,” a nice match for the space. 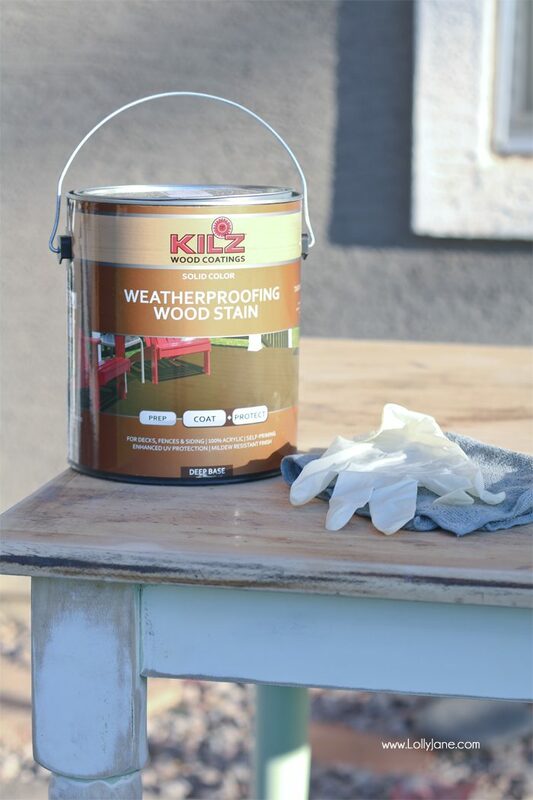 Since KILZ® wood stain is a 100% acrylic formula, it offers excellent protection from the sun’s harmful UV rays, a bonus since I live in the Phoenix desert; I don’t have to worry about my newly stained top fading anytime soon. Wipe off excess wood dust with a damp rag, let dry. Let dry completely (24 hours) before use. Note: If you’re in extreme heat like me, (temperature over 100 degrees,) then I would suggest working in small areas as stain dries fairly quickly. You can see how light each coat goes on; rest assured, after several coats it will stain as dark as I have used a variety of KILZ® products for so many years that I wasn’t worried at all. 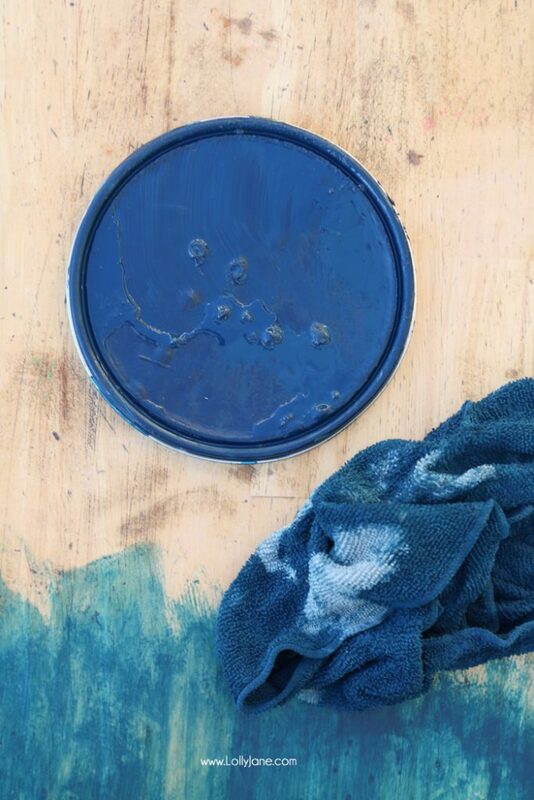 Through experience, KILZ® has given me the confidence to trust my vision to transform my surfaces, whether paint on the walls or stain on a tabletop, and finish my job the right way… every time. Look at that natural shine! True to Lolly Jane’s style, however, we added a slight distress on the edges of the stained top by lightly sanding to coordinate with the chippy legs. 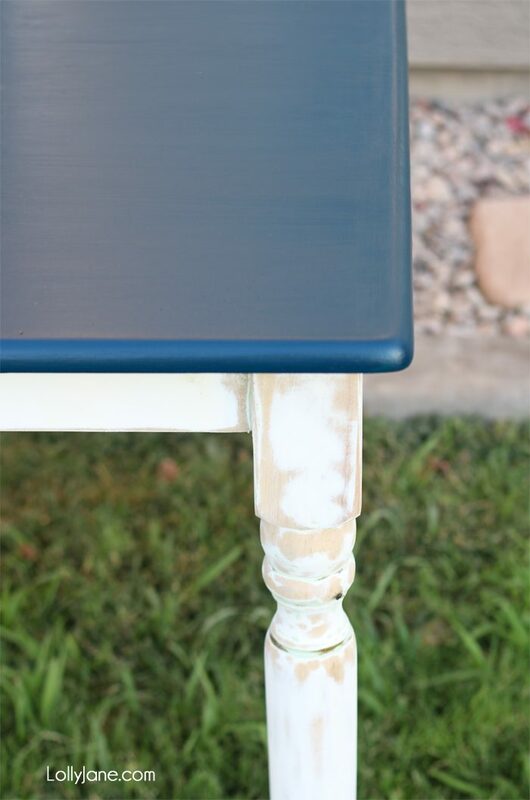 I just love the base of the table and the contrast of the bright white against the navy blue stained top. 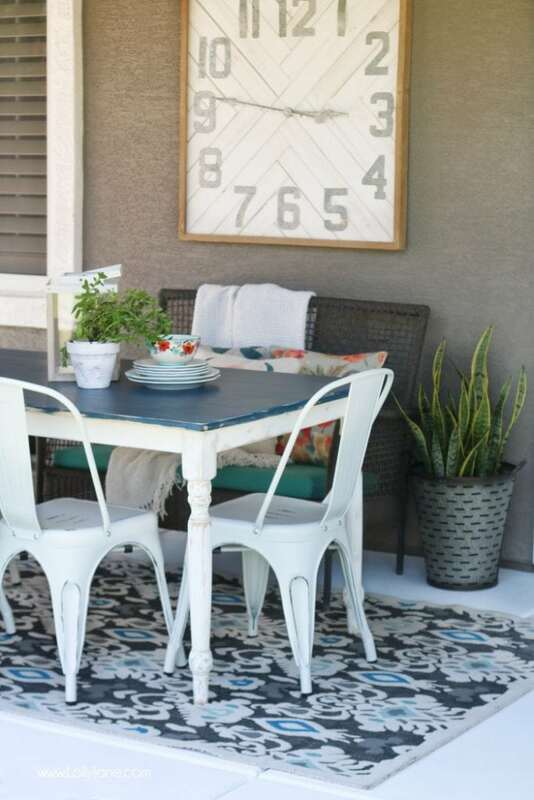 Here is my beautiful modern farmhouse table completely transformed in less than a day and ready for entertaining, games, barbecues, or desserts. 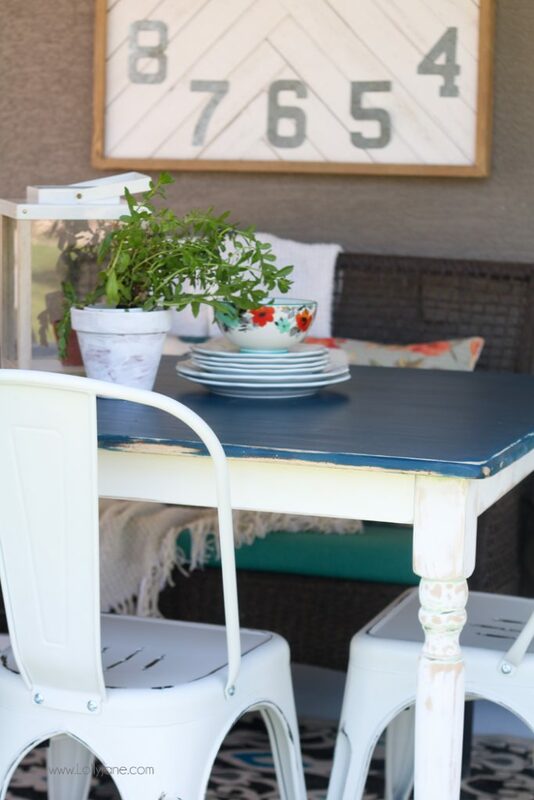 I love how this table turned out and am already dreaming up other outdoor projects I can use KILZ® wood stain on… decks, railings, shakes, shingles, siding, roofs, fences, wood patio furniture, or even my kids wood jungle gym that has faded the last few years. The possibilities are endless, for sure. 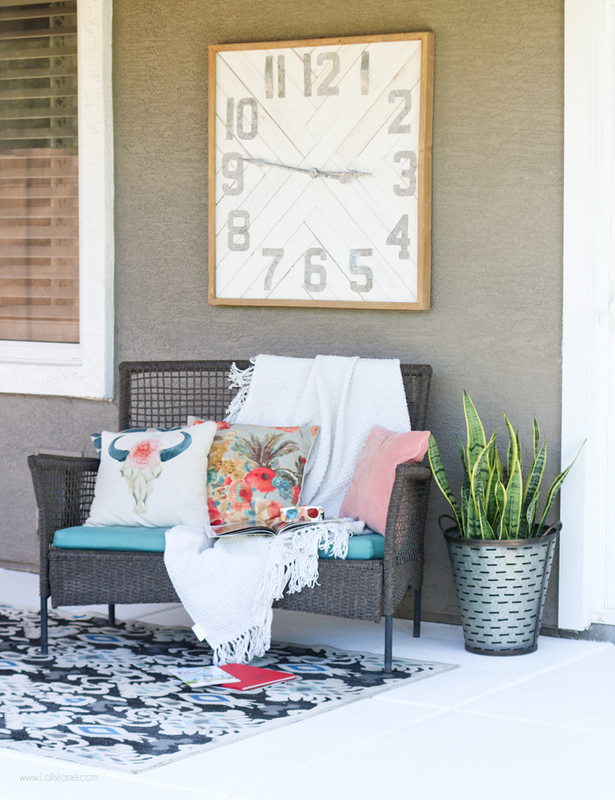 Did you spy my newly painted concrete patio? I think this table couldn’t look more perfect in this space! I tried a competitive brand that claimed stain/protective finish all -in -one. I had sanded my table top to bare wood. Stained it a driftwood color (with white legs ????) and it looked great. However…over the next few months I found out that a dribble of mayonnaise or a milk spill would literally pull up the stain!! Ugh! I’m back to square one. Going to try Kilz!! Great tutorial! I love the result. The blue color is so attractive, and I really like the distressing, especially to go with those chairs. Thanks for posting. What a pretty transformation. Love the pop of colour to the outdoor space. So pretty! Oh wow! What a gorgeous table! 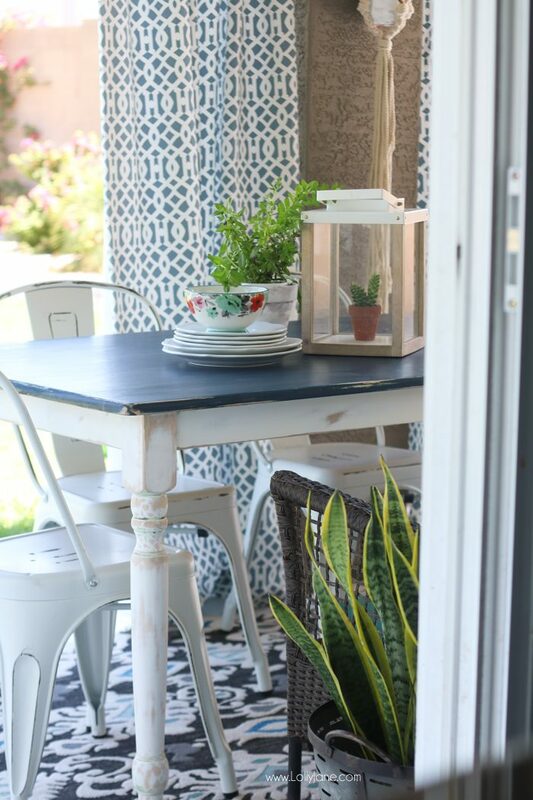 I was struggling as to what table would go with my new front porch furniture and now I am mad at myself for just succumbing to the matchy-matchy that I did by buying the table that went with the furniture! This would have been a much better and more creative choice! I have shared this over on Facebook! Thank you for always sharing at Celebrate Your Story! This is a beautiful and quaint. 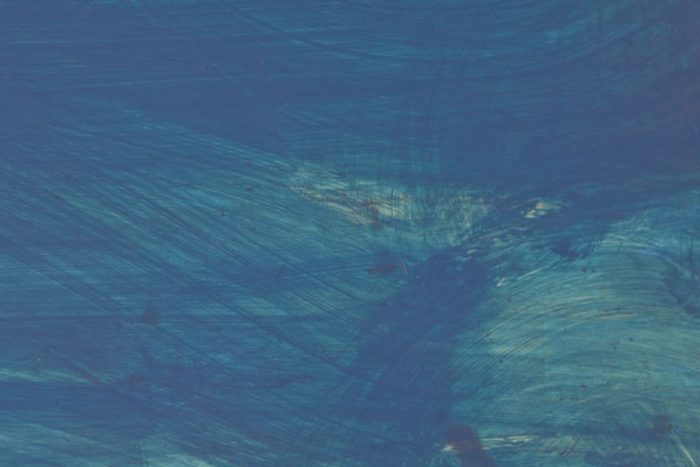 I really love the shade of blue you chose. Oh I love the new color! Thanks for sharing @ Vintage Charm–pinned & tweeted! Sadly there is no “altantic deep” now. Oh, bummer! Thanks for letting us know, Annie! We updated the post!